If you’re looking for a meaningful gift for a friend or a loved one this season, but can’t face the city crowds or summer heat, consider the increasingly popular “charity gift”. Australia for UNHCR has released a gift guide to support refugees and displaced people around the globe this Christmas. It allows the gift-giver to choose a gift from an online catalogue – spending as much (or as little) as they want – and instantly receive a personalised card for the recipient. All gifts support the UN Refugee Agency’s life-saving and life-changing work with refugees and displaced people around the world. Gifts in the catalogue cover emergency aid items, including safe water, food, shelter and health care, or are for long-term development projects such as education. Gifts that are especially important at this time of year are those that support the Winter Survival Fund for displaced Syrians and Iraqis across the Middle East. Aisha, a young mother with three children, lives in a tent in Lebanon with her family. They fled the war in Syria more than three years ago. She told UNHCR that in winter she was scared every time it snowed, as the snow would pile up on the top of the tent. “My husband must go on the roof every hour to clear the snow and I’m worried he might fall,” she said. Fortunately, UNHCR was able to help with some basic items, but the family still needs assistance to get through the winter. 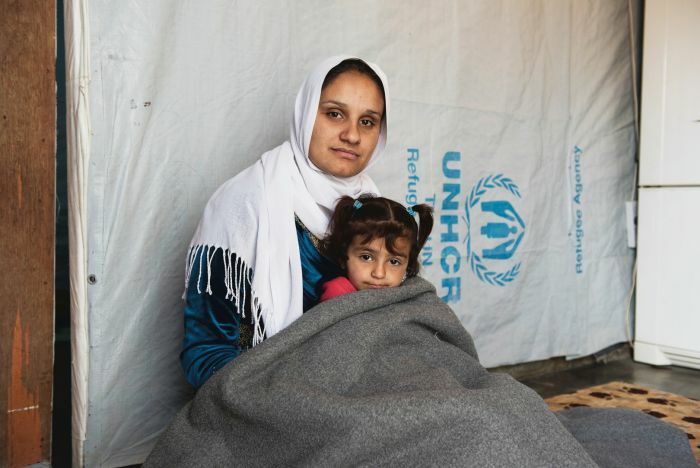 “UNHCR took care of us with blankets and sheeting and the stove is very warm, but we need wood,” Aisha said. A little goes a long way for families like Aisha’s. Just $25 can provide a family with blankets and mats, giving them a warm place to sleep; $95 can reinforce a makeshift shelter against the elements; or $565 can help provide a durable and low-cost shelter for a family of five. Ms Steer said: “At a time of year when people often spend the most money on each other, giving just a small part to help some of the most vulnerable people in the world means you know your gift will help save lives. “A charity gift gives twice. First to your friend or loved one, but also to the family whose everyday survival is transformed by the gift you choose,” she added. To learn more about the situation for refugees and displaced people across the globe go to unrefugees.org.au – or keep an eye out for teams of Australia for UNHCR fundraisers this month. Visit www.unrefugees.org.au/gifts. Australia for UNHCR is the national partner of the UN Refugee Agency. It is an Australian charity, which fundraises to provide life-changing humanitarian support to refugees and other displaced and stateless people supported by UNHCR.